Though part of the popularity of this event is surely the pure child-like joy many find in the chugging steam engines of old, there is also a more poignant pull for Italians for whom these abandoned, weed-infested tracks are means of peering into the not-so-distant past of an Italy made up of tiny hamlets connected to the larger world by almost exclusively by these “I-think-I-can” engines and their rugged, no-nonsense cars. Building on this nostalgia, there has been a resurgence recently in rail lines used almost exclusively for tourism, popular because they offer either uniquely scenic or historic rides. For passengers who want to travel quickly from city to city, Italy’s sleek, modern rail network can get you there in a matter of hours. But if you’d rather take a meandering route through some of Italy’s prettiest countryside (perhaps under a puff of steam), here are a few routes to consider. Tweetable: Travel by Italy’s historic rail routes is a unique way to see gorgeous landscapes and hidden villages. Known as the Trenino Rosso (Little Red Train), the Bernina Express recently celebrated 100 years of travel along its narrow-gauge tracks through the Alps spanning the Swiss-Italian border. Perhaps one of the most spectacular train routes in the world, the Trenino Rosso climbs the Bernina Pass (at more than 2,000 meters), passing through 55 tunnels, over almost 200 bridges, and through an Alpine landscape of snow-capped peaks and pristine glacial lakes. This breathtaking route between the Italian town of Tirano and Swiss St. Moritz, part of which is a UNESCO World Heritage site, combines scenery and history into an unforgettable 2.5 hour ride, or, for even more Alpine photo-ops, travelers can continue on another few hours to Chur. For those who have a few days to indulge their rail passion, there is no train as iconic as the Orient Express. The VSOE—or Venice Simplon Orient Express—connects Venice to London, Paris, or Budapest by way of the Roaring Twenties, and everything from the uniformed stewards to the sumptuously restored vintage carriages, to the elegant dinner dress code transports passengers to the Europe’s sophisticated golden age of rail travel almost a century ago. Though the route has stretches of gorgeous Alpine scenery, more than the line or the destination, this trip is about the train itself, with its 35 sleeping carriages and four dining cars, all restored to their former Art Nouveau glory. This modern, narrow-gauge train runs along historic tracks between the towns of Domodossola at the foot of the Italian Alps and Locarno, on the Swiss tip of Lake Maggiore, passing some of the most beautiful scenery of the Centovalli and the Valle Vigezzo and the Simplon Pass along the way. The 2 hour route--which uses 83 bridges and 34 tunnels to carry passengers past craggy peaks, thick forests, rushing rivers and waterfalls, and a number of Alpine villages on a dizzyingly steep route (at stretches reaching a 6% incline)--has run continually since its inauguration in 1923, continuing to carry passengers even during this area's heavy World War II partisan fighting. In the Val d’Orcia south of Siena, the line running between Asciano and Monte Antico has recently been restored and reopened after a reduction in passenger traffic led to its retirement in 1994. The antique steam engine and vintage cars now run on select Sundays and holidays in spring and fall, transporting passengers to a number of food festivals, fairs, and markets (primarily truffle) in the tiny villages dotting these Tuscan hills, famous for its gentle, undulating landscape and excellent food and wine. This is an all-day excursion (with trains departing from Siena in the morning and not returning until late afternoon), and an Italian language submersion (some information is available online in Italian, but the lions’ share of your fellow passengers will be Italians), but at €32/round trip, it’s a wonderful way to explore the tiny towns of southern Tuscany and discover their local culture and cuisine. 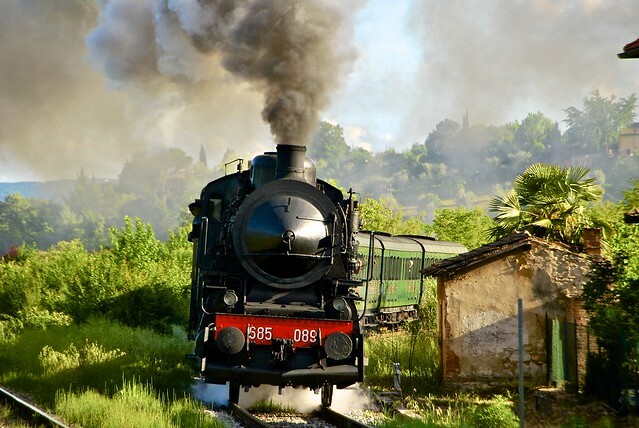 These historic steam engines depart from Milan and nearby towns in Lombardy (including Bergamo and Treviglio) to take passengers along on a scenic route skirting the Oglio River and shores of pretty Lago d’Iseo, one of the smallest and quietest of northern Italy’s lakes. Most of these all-day Sunday excursions are themed around local food and the area’s most famous wine: Franciacorta. A DOCG wine since 1995, Franciacorta produces still whites and reds, but by far its most popular is its sparkling white, similar to Champagne in technique and taste. Many of the Trenoblu trips also include a stop at the town of Iseo, and a chance to hop one of the ferries Monte Isola, which has pretty walking trails up to the sanctuary on its peak. Not all of Italy’s mountain trains are in the Alps. In the Apennine peaks between Abruzzo and Molise, the Transita line runs one Sunday a month through the spectacular scenery between Sulmona and Isernia, much of which is parkland. While passengers gape at the vistas over the Majella National Park and the high-altitude plateaus of Abruzzo (giving the line its nickname of the Italian Transiberian), stopping at a number of tiny mountain villages and passing through the second highest train station in Italy (Rivisondoli-Pescocostanzo at almost 1270 meters), they can also sample some of this area’s best wine and food offered on board. Tours and tastings are exclusively in Italian, but it doesn’t take a second language to appreciate this wildly beautiful and almost unknown area of Italy and its cuisine. 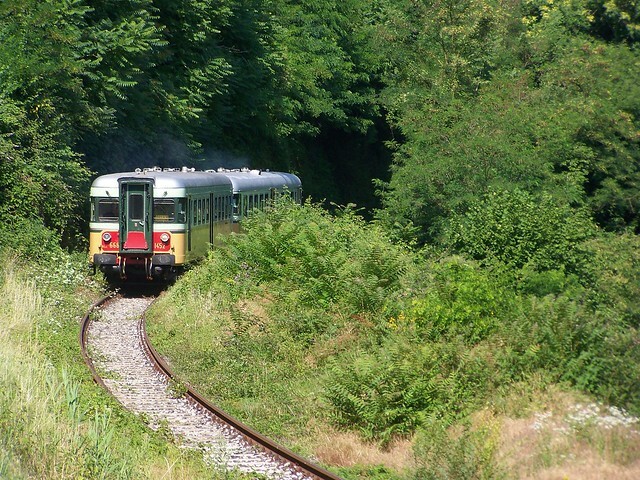 Tweetable: Combine history and food on one of Italy’s new “gastrotrain” routes, which feature local cuisine on rails.